The Song of All by Tina LeCount Myers is a book that has been on my radar for a while, and with the release of the sequel, recently my interest has been sparked again, which is why I am so grateful for the team at Wunderkind and Night Shade Books for the opportunity to check out this series! Imagine a world steeped in myth and ancient legend, where the conflicts of gods and mortals have played out over a harsh, icy landscape for time immemorial. Inspired by Scandinavian culture and folklore, the setting of The Legacy of the Heavens transports readers to the wild fringes of the tundra, where Irjan, a reindeer herder, lives with his young family among his wife’s people. But Irjan had not always lived such an unassuming, quiet life. Before he became a farmer and settled down, he was known as one of the most ruthless and skilled warriors among the Brethren of Hunters, an order that trains its members to kill Jápmemeahttun—a race of immortals that have been warring with humans for centuries. But killing was never in Irjan’s nature. Eventually, he got tired of the endless bloodshed and turned his back on the Hunters and his oath, retreating to a peaceful village where he got married and had a child. He has kept his past a closely guarded secret ever since, not even confiding in his wife. But soon, Irjan will find that his past is not so easily left behind. A nosy priest in the village whose ambitions know no bounds has caught wind of what Irjan used to be. In his treachery, the scheming priest destroys everything the former Hunter has worked so hard to build, taking everything he holds dear. Not knowing the truth of what happened, Irjan believes he is being punished by the gods for forsaking his oath and embarks on a journey that will not only determine his own fate, but that of his son as well as the entire world and its peoples. There’s a lot to unpack here. And in doing so, there might be a danger of becoming mired in the details, but once you get into the meat of the story and the larger picture is revealed, it gets easier to see what it is all about. At the beginning though, it helps to focus on the central character of Irjan, taking in his backstory and the implications of his decision to walk away from the Brethren of Hunters. His former comrades are not the kind to take defection lightly, and a terrible tragedy occurs within the first handful of chapters, one that I did not expect so early on. However, this event sets the stage for the rest of the novel. What follows next is a clear push to get as much information to the reader as possible, and the result is a strange feeling of being simultaneously hustled through the motions while also being encouraged to slow down to take in other threads explored by the book. One of these threads belongs to Aillun, a Japmea woman whom Irjan comes across in the wilderness. With the introduction of her character, we’re allowed a glimpse into the lives and traditions of the immortals. They are a unique and fascinating people, whose life cycles involve a series of transitional stages and changes, and of course, special mention must also be made to the Song of All, the song which all Jápmemeahttun are tapped into as a form of collective consciousness. Meanwhile, another thread continues to follow through on the machinations of the priest and his acolyte in the village, as well as their dealings with the Hunters. Both these storylines are woven into Irjan’s, and together they form a rich narrative that is the summation of all the characters’ motivations and actions. With all this going on, admittedly things are bit shaky at first. Once the story finds its footing though, it quickly becomes immensely enjoyable. This is the way epics are created, slowly and gradually, building increasingly complex layers upon a solid foundation, proving that a little patience early on can go a long way. In her author’s note, Tina LeCount Myers also writes that her novel’s world was influenced by the northern cultures of Norway, Sweden, Finland, and extreme northwestern Russia. She draws heavily upon the various Saami languages spoken in these regions, which can be seen in a lot of the terms and names. There are also the occasional verse breaks where the Song of All will feature. All of this might seem a bit jarring initially, but again, they’re part of the unique collection of attributes that make this novel special, and the reading experience gets easier once you gain a handle on the rhythm and style of the writing. 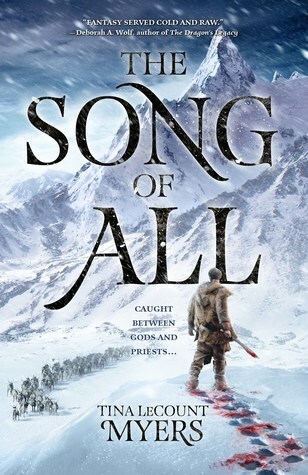 Like a lot of epic sagas, The Song of All is a slow burn, but ultimately builds to an action-packed and suspenseful ending. Fantasy fans will be no stranger to this pattern, though the first half of the book may require a bit of effort to get into, as well as time investment on the reader’s part. The payoff is worth it though, and I look forward to reading the next book especially given all that happens in the final chapters. Never heard of this one, but it sounds good! Thank you! I was pleasantly surprised how much I enjoyed the book! Arghhh damn that priest, nothing makes me angrier than a priest for some reason. Yes, it’s always those meddling priests, lol! Wonderful review Mogsy! I am happy the slow beginning was worth it. A farmer former warrior…there is so much potential for the future! Definitely! I can’t wait to find out what’s next with the second book! This was not on my radar at all but I like the sound of it and I don’t mind a book that takes it’s time with the set up so long as it all becomes worth it. Hope you get a chance to read it soon! Yeah, I was definitely drawn to the snow and ice on the cover, lol! There’s something the arctic or tundra setting that really appeals to me! I love the cover of this book-the scenic snow vista and the blood! Oooh! I love that cover!